An Independent Film Channel original series from executive producer Lorne Michaels, Portlandia is a hilarious satire about all things Portland, Oregon. The show’s stars, Carrie Brownstein and SNL’s Fred Armisen, are a fantastically comedic duo. The wheat-germy, hippie-ish environs of Portland are filled with vegans, bicycling hipsters, and feminists and Portlandia embraces and completely makes fun of them at the same time. Portlandia is sketch comedy at its finest. In the first episode, there is a bit about the Sherlock Homies, an adult Hide-and-Seek team that meets for tournaments in the public library. 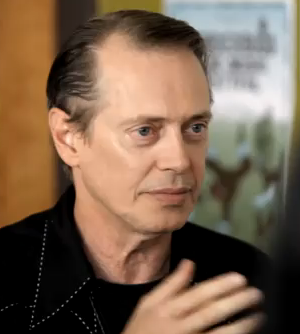 Portlandia has a slew of guest stars such as Jason Sudeikis, Sarah MacLachlan and Heather Graham and my personal favorite, Steve Buscemi. I also found it really cool that the actual mayor of Portland, Sam Adams (actual name), appeared on the show as the assistant to the fictional mayor. The worst part about the show? There are only six episodes in the first season. Fortunately a second season of 10 episodes is scheduled to air in January 2012. 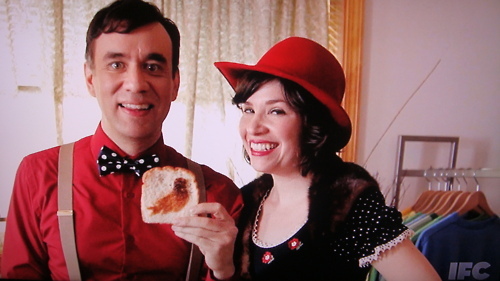 If, like me, you do not get the IFC channel because you are broke, you can watch episodes of Portlandia online. This entry was posted in Art and tagged Carrie Brownstein, feminist, Fred Armisen, Heather Graham, Hide and seek, hilarious satire, hippie, hippies, hipster, IFC, Independent Film Channel, Jason Sudeikis, Lorne Michaels, mayor of Portland, Oregon, Portland, Portlandia, put a bird on it, Sam Adams, Sarah MacLachlan, satire, Savannah, Sherlock Homies, ShopSCAD, Steve Buscemi, vegan, wheat germ by Sarah. Bookmark the permalink.